The man was filled with relief and said, “Thank you, Lord,” and he did as he was told. Upon entering the other door, he saw many crosses, some so large the tops were not visible. Then, he spotted a tiny cross leaning against a far wall. “I’d like that one, Lord,” he whispered. 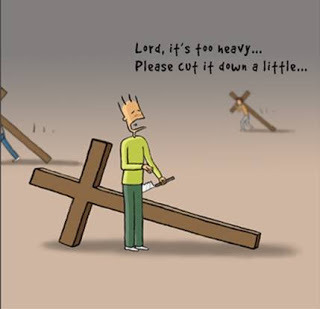 And the Lord replied, “My son, that is the cross you just brought in.” When life’s problems seem overwhelming, it helps to look around and see what other people are coping with. You may consider yourself far more fortunate than you imagined.